Cartoon by S. Reynolds/ CC BY-SA 4.0. As Yemeni civilians’ lives become increasingly desperate, they become increasingly isolated, their suffering made invisible by a near-total lack of Western media interest or attention. No commercial flights are allowed into the Sana’a airport, so media teams and human rights documentarians can’t enter the areas of Yemen most afflicted by airstrikes. The World Food Program (WFP) organizesa weekly flight into Sana’a, but the WFP must vet passengers with the Saudi government. Nevertheless, groups working in Yemen, including Amnesty International, Médecins Sans Frontières (MSF), Save the Children, Oxfam, and various UN agencies do their best to report about consequences of the Saudi-Emirati led coalition’s blockade and airstrikes. The UN Charter begins with a commitment to save succeeding generations from the scourge of war. The UN Security Council has miserably failed the Yemeni people by allowing the scourge of war to worsen, year by year. 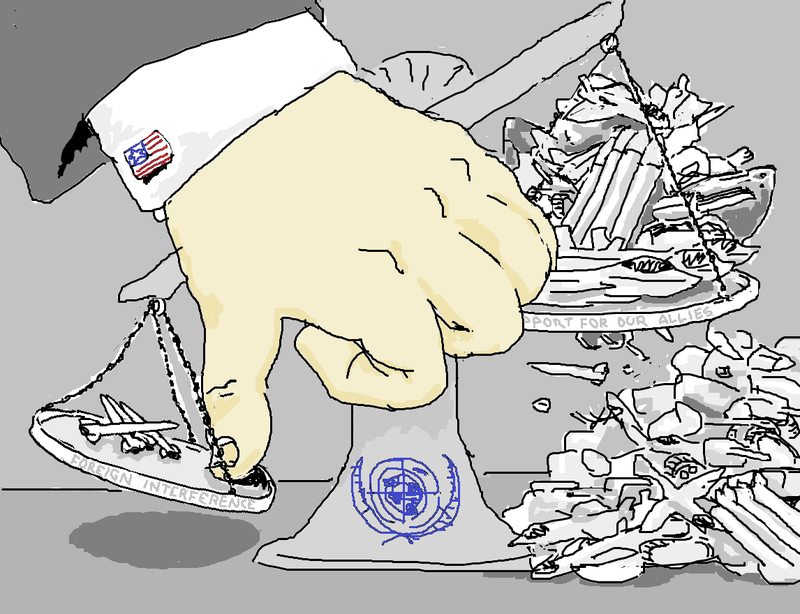 By approving biased resolutions that neglect to even name the most well-funded and sophisticated warring parties in Yemen– Saudi Arabia; the United Arab Emirates; the United States — the Security Council promotesthe intensification of brutal, apocalyptic war and enableswestern war profiteers to benefit from billions of dollars in weapon sales. Weapon manufacturers such as Raytheon, Lockheed Martin and Boeing then pressure governments to continue selling weapons to two of their top customers, Saudi Arabia and the United Arab Emirates. Yemeni civilians, especially children, pose no threat whatsoever to the U.S. Yet,U.S. support for airstrikes, blockades and the chaos inevitably caused by prolonged war threatens Yemeni civilians, especially vulnerable children.They have committed no crime but are being punished with death.